It’s not about strength; it’s about balance. These were the sage words of advice from my rock-climbing friend, Paul, as I tried (and failed) to haul myself up a six metre slab of Peak grit stone one summer’s day in the 1990s. Paul proceeded to demonstrate his point by climbing the very same piece of rock with his hands behind his back. I say, ‘climb’, but from where I was standing, it looked more like dancing: a series of seamlessly linked steps, each footfall landing with precision as he skipped merrily up the face. How easy it was then, how simple – the same route that had defeated the best efforts of my brain and body seemed to rise to meet him as he moved. And of course, it was far from easy – Paul was an athlete at the top of his game, a climber who climbers respected (not that you’d know, he was unfailingly modest) and his deftness was born from years, months, weeks, days, hours, minutes and seconds of refined focus – each one of those steps carried a whole lot of history. I recount this story by way of a loose analogy for the work of Leicestershire poet, Mark Goodwin, partly because he is a rock climber, and some of his poems deal with the experience of climbing, but mostly because his poetry wears a similar surface easiness, a similar sense of balance, a similar sense of focus. Steps, Goodwin’s first collection for Sheffield’s Longbarrow Press, ostensibly fits in with the publisher’s current, broad psychogeographical remit: previous hardbacks have included Matthew Clegg’s searing visions of sub(urban) collapse in West North East and The Footing, an anthology focused on the theme of walking. Goodwin’s poems are similarly embedded in landscapes: from Wales, to Andalucía , to Ethiopia and back to Cornwall in the collection’s lengthy centrepiece sequence ‘From a St Juliot to Beyond a Beeny’. However, Goodwin makes it clear from the start that these are poems as much concerned with phenomenology, the movement of the mind, as any physical journeying. The opener, ‘Walk’, structures itself around a series of imperatives (‘Put a foot on a rock’, ‘choose’, ‘follow’, ‘wander’, ‘smell’), each command filling out a sensual panorama of an unnamed scene. It’s a simple idea – the sort of prompt you see in classrooms and creative writing workshops across the country, but what Goodwin does with it is anything but. Firstly, he uses the layout of the poem itself as a visual metaphor for the walk itself; the lines scatter and stumble, abruptly halt then stretch and expand, tumble down terraced paragraphs. This also audibly modulates the pace of the poem – you can feel it your hips, the balls of your feet. There is also a further, deeper structure in the poem’s artful use of alliteration (‘Side-step. Skip. Scamper.’ ‘Wade water’s white crystal form.’). 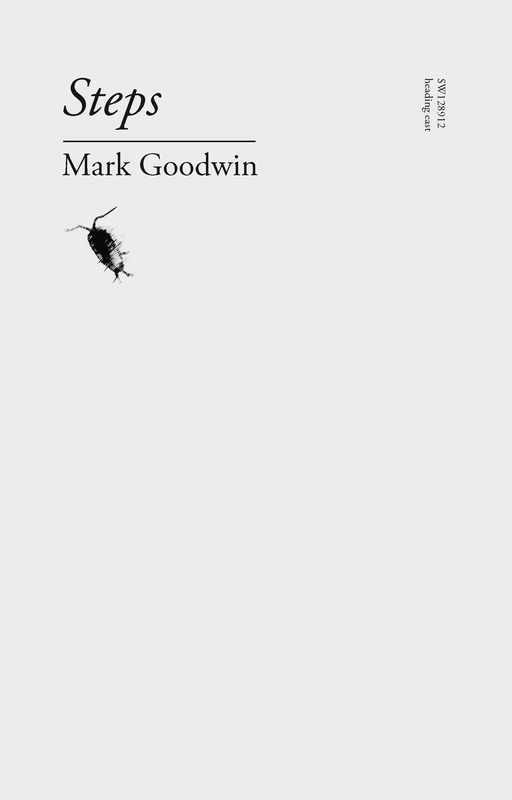 Consonance can be a kind of shorthand for chthonic resonance; one thinks of Heaney’s peat-cutting squelch or Hughes’ craggy phonology, but here Goodwin seems to be signposting something in time, rather than space. ‘Walk’, although presented like a modernist, concrete poem, harks back to the Anglo Saxon alliterative form – one thinks specifically of ‘The Seafarer’. Perhaps, the poem seems to be saying, when we are truly absorbed in the moment, when we know ‘without knowing’, the moment itself breaks free of temporal boundaries. Again the simplicity of execution, again the extraordinary foregrounding of the moment itself: these are not meditations on mortality, but celebrations of being. Goodwin’s openness to experience leads him to some interesting places, or rather, his mindfulness makes being in any place interesting in itself. Thus, the same care and attention is afforded waking to the song of a blackbird at a friend’s house as is dangling from a precipice with both his own and his son’s lives in his hands. Poems set in Spain and in Ethiopia are lent the tang of locality through linguistic cues, but the thread of mind and landscape runs through both. I’m a little less convinced by some of his stylistic tics. He’s very much interested in extending form itself, sometimes through ‘sound-enhanced’ performance, sometimes through the graphology of the poem. And sometimes this pays off wonderfully, as in ‘Particular Winter, Trossachs, January 2010’, where the words themselves become a spindrift of icy fragments, the text itself fading into ‘furry smoke light’. Elsewhere, his habit of splitting words into enjambed, syllabic sections (‘I / ‘ve gone’, ‘could/’ve) risks becoming, well, habit. I’m reminded of the thrill of first reading E.E. Cummings as a teenager and how this thrill dissipated through familiarity. It seems counter-intuitive for a poet with such an obvious talent for making things ‘new’ to stamp his work with a sell-by date. Perhaps this is simply a climber’s sensibility. After all, what is life without risk? There’s a photograph of Mark Goodwin on the Longbarrow website. He’s performing a tightrope walk on the metal safety railing on the edge of a cliff. Faced away from the camera, he teeters precariously above the void, one leg swung in the air as he holds his position. It’s terrifying, though there’s something about his posture which convinces you that he’s never going to fall. The message is clear: to truly balance, first take your feet off the ground. Posted in Book reviews and tagged longbarrow press, mark goodwin, steps. Bookmark the permalink.